Tunisia-based private equity firm Africinvest has teamed up with Cathay Innovation — the venture sub of Paris-based private equity firm Cathay Capital — to launch a new Africa tech fund with a target raise of $168 million. Details are still forthcoming, but the Cathay Africinvest Innovation Fund will focus primarily on Series A to C-stage investments in African technology companies, says fund co-founder Denis Barrier. “We’ll look at investments across several countries in Africa. We’ll focus on areas such as fintech, logistics, AI, agtech and edutech,” Barrier says. Barrier could not say when the fund would be closed, but did confirm investments could come as early as summer 2019. He expects to see strong local showing for startups from across Africinvest’s 10 country offices in Abidjan, Algiers, Cairo, Casablanca, Dubai, Lagos, Nairobi, Paris, Port Louis and Tunis. The firm will open an office in Johannesburg in the near future, according to a company release. In the private equity space, both founding companies of the new Cathay Africinvest Innovation Fund carry considerable capital and scope. Co-founded by Denis Barrier and Mingpo Cai, Cathay Capital, the parent of Cathay Innovation, has $2.5 billion in assets under management and offices in the U.S., Europe, Asia and the Middle East. Per Crunchbase, Africinvest’s 46 venture and debt investments span the brick and mortar side of many of the sectors the new tech fund looks to target, including education and banking. With the line between banks and fintech also starting to blur in Africa, that could lead to an advantage for the Cathay Africinvest Innovation Fund in sourcing deal flow. The new investment group enters during a period when investment rounds and the number of funds focused on African startups continues to grow rapidly. By Shenzen or Silicon Valley standards, the value of VC to African startups — which surpassed $1 billion for the first time in 2018 according to Partech — is minuscule. But by one estimate, that represents more than a 100 percent increase in VC to Africa over a four-year period. 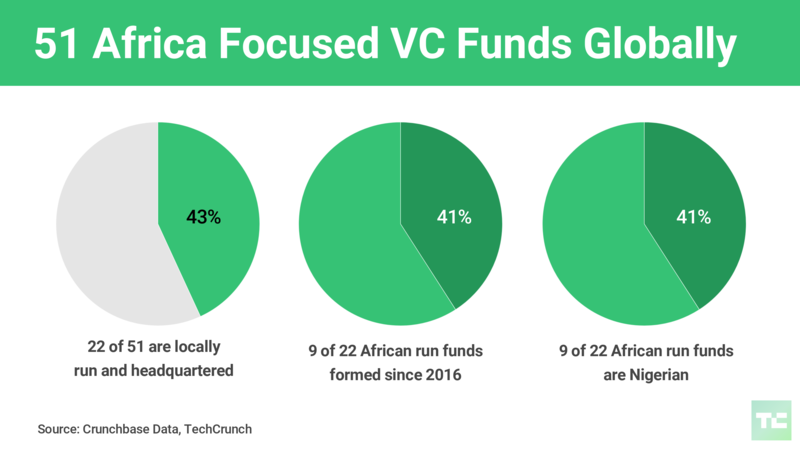 The number of Africa-focused VC firms globally has also grown, topping 51 in 2018 per TechCrunch and Crunchbase research. The Cathay Africinvest Innovation Fund takes the number up to 52.